A fantastic Church with lots of fine detail that needed to be captured. 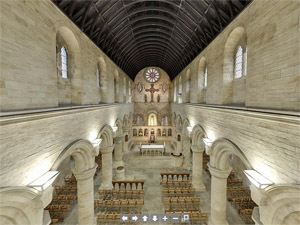 This virtual tour had to be shot with multiple exposures in order to capture the shadow areas and the bright stained glass windows. Clink on the image below to see the virtual tour. The church was built by the Grimston brothers for the workers who came to work in their flax mill to enable them to attend Holy Mass. The church is in the Romanesque style by J. A. Hansom to designs by Ramsay The tower was built to designs by George Goldie. It was opened in great style by Archbishop Wiseman of Westminster on 24th May 1848. Eleven years later it was consecrated by Bishop Clifford of Clifton. The church is built in limestone with a slate roof. It has a seven bay aisled nave and chancel with a small east Lady Chapel and a five stage west tower with buttresses to the fourth stage. The Blessed Sacrament Chapel is on the south side and the sacristy is on the north side. There is a three bay arcade under the west organ gallery in the tower. The aisle arcades have plain cylindrical pillars and octagonal capitals to round arches, The three eastern bays form the sanctuary. Its first pillars are carved in fish scales and a rope design. At the south west corner of the tower there is a square stair turret which becomes cylindrical after the second stage and has conical roof with a finial.